Now, with these supplies and the instructions below, let's make a baby-sock rose bouquet! 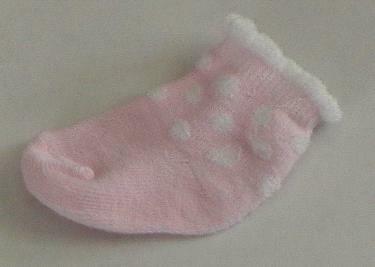 Step 1: Lay out your first baby sock. It doesn't matter if the toe is to the left or right. 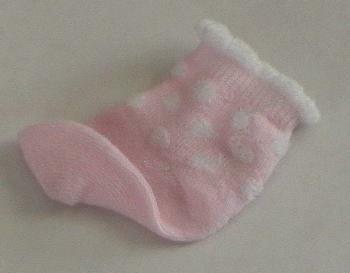 Make sure you are using baby socks, rather than baby booties. 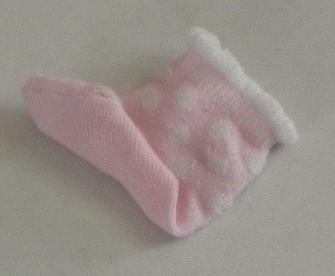 Baby booties are too long and don't form a very good flower bud. 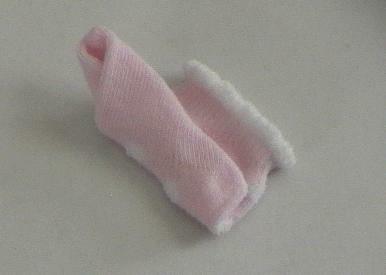 Step 2: Now, start to fold the toe of the sock upwards (as shown to the right). Don't roll the sock too tightly, but don't let the roll be big and loose either. Roll the base of the sock up so that it is parallel to the opening of the sock. Then slightly angle the toe of the sock upwards, toward the opening. Step 3: Make a second roll in the sock. Keep your rolls fairly tight, but don't overly tug or stretch the sock while rolling it up. Step 4: Make a third roll similar to the second. 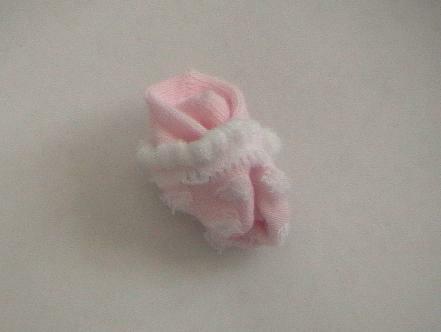 Most baby-sock roses require only 3 rolls (baby socks are not very big, obviously). When you make your last roll, make sure to leave a little bit of unrolled sock by the opening (as shown to the right). Step 5: Now, while holding the rolls together with one hand, take the opening of the sock with the other hand and begin to open the sock (inside out) around the rolls. Step 6: Continue wrapping the opening of the sock around the rolls until you have wrapped the opening about half-way up the the length of the rolls. As a second part to this step, pull the rose bud straight, and adjust the opening (that you wrapped around the sock) so that it looks even. Step 7: To make the rose look more like an blooming blossum, pull the inner part of the sock out from the top of the blossum. Step 8: Take the floral wire and cut about 12 to 16 inches off for each stem, using the wire cutters. 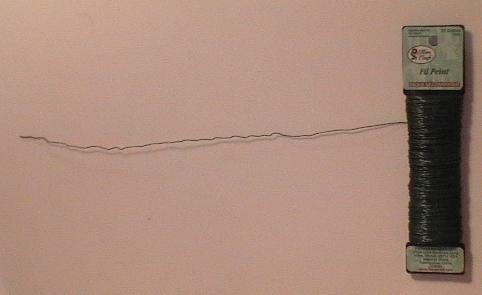 Then, with your fingers, bend the wire back and forth, making little bends in the stem. This makes for a more substantial looking stem after you wrap it with floral tape (as you will see in a later step). 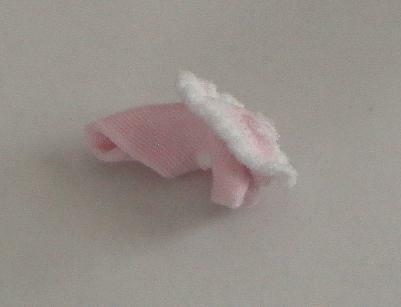 Step 9: Place the wire stem into the bottom opening of the baby sock rose. Place it as high up the sock as you can go, without it poking through the top of the sock. An inch is a good distance. 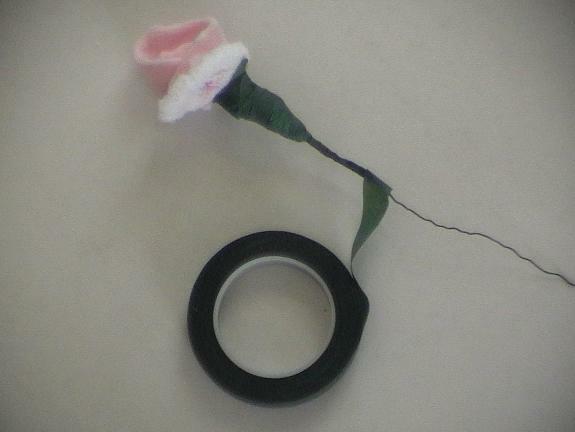 Step 10: Take the floral tape and begin wrapping the sock rose fairly high up the base of the flower. If you don't begin high enough, the compression of the tape will push the rest of the rose out of the base and it will fall apart. So begin high, and wrap very tightly, being careful not to disturb the blossom. The floral tape will stick to itself when you start to overlap layers of tape. As you wrap around the base, begin to wind the floral tape downward towards the stem. (Sometimes it helps to take the stem out as you begin wrapping the tape, but place the stem in before you go too far). 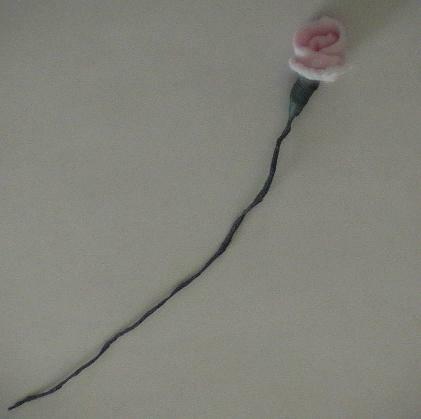 Step 11: Continue wrapping the base of the rose with the floral tape and continue down the wire stem. It helps to spin the flower by the already-wrapped base rather than spinning it by the already-wrapped stem (because the floral tape on the stem will begin to unravel). Step 12: Continue wrapping the stem all the way to the bottom, cut the tape and Voila! 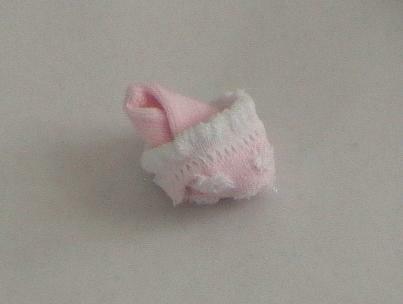 You have finished your first baby sock rose!!!!! Now, using the instructions above, make as many roses as you want for your baby sock rose bouquet. You can't go wrong with a dozen roses, BUT that is quite a bit of work - so my advice: make your first rose and then decide how many you would like to include in your bouquet. After the first 2 or 3 roses, it gets to be pretty simple. Step 13: Place the baby sock roses into a vase, and then add additional greenery, baby's breath, and/or other floral pieces to complete the baby sock bouquet. 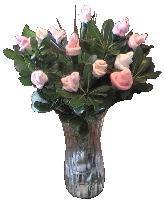 For the baby sock rose bouquet in the picture, I added one small packet of greenery and then placed several stems of small, white flowers to add volume to the bouquet. 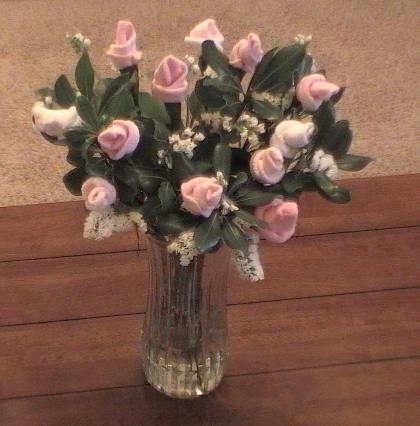 Doing this also gives more balance to the bouquet, and it looks almost like a real bouquet of roses! 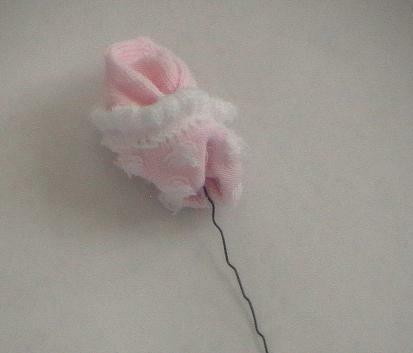 I hope that these how to make a baby sock rose bouquet instructions help you! For many women, receiving a bouquet of flowers is a very meaningful and special experience, even if they are made from baby socks! 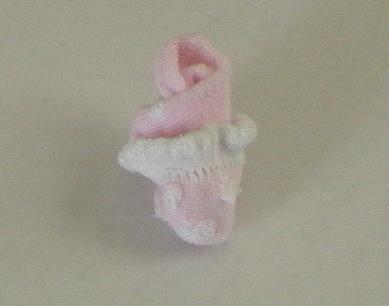 So good luck making a bouquet of baby sock roses, and send me a picture of the finished product when you are done. I would love to post it on the website here!